Sim card data recovery software recovers your deleted text messages (read and unread), phone numbers (dialed numbers and fixed numbers) along with their specific contact name. Sim card data retrieval program provides read only and non destructive solution to recover your lost data from mobile phone sim card. 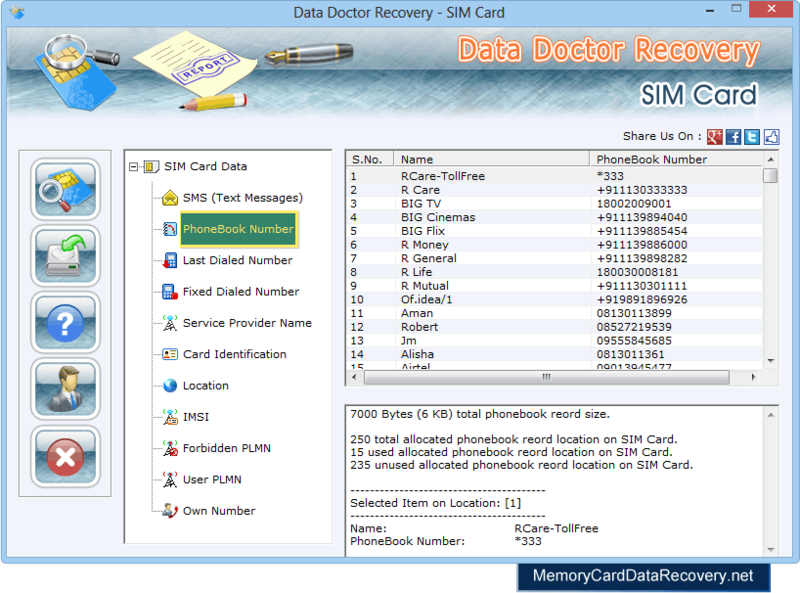 Sim card data recovery software uses advance and standard search recovery algorithms to recover deleted sim card data. Sim card data rescue program successfully retrieves deleted text SMS from inbox, outbox and draft with their corresponding date and time details. Sim card data undelete tool restores lost data from GSM sim card of any network providers. Sim card data retrieval program completely get back your lost sim card data with their corresponding sim IMSI number and ICC-ID card identification numbers. Sim card forensics software is fully compatible to work with all PC/SC or phoenix standard based USB sim card reader. Sim card data restoration software has ability to restore lost data from corrupted sim card of any country and network. Sim card data undelete program provides facility to save your recovered sim card data in txt file format for future references.